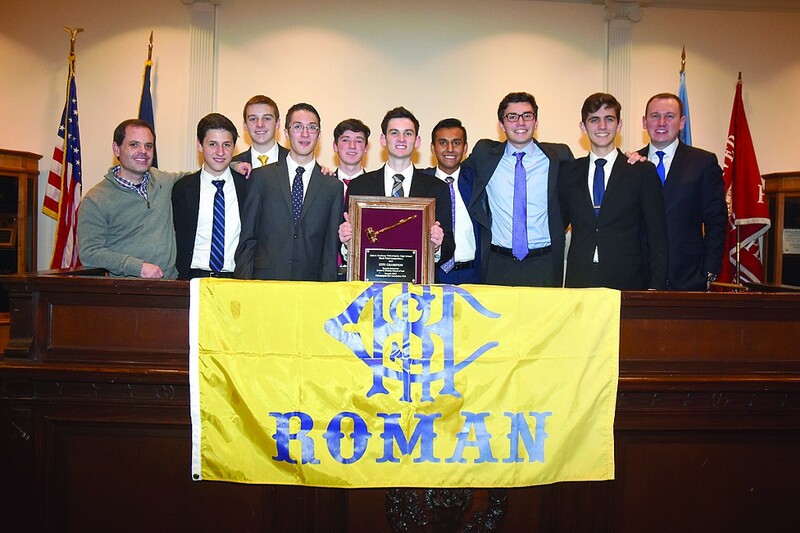 Roman Catholic’s mock trial team has earned another city championship judgment. Dre Nash, founder and CEO of Nash Automotive, sat on the witness stand testifying to the integrity of his former employee, Taylor Edsel, as Edsel stood trial for setting fire to the company’s alternative fuel automobile factory. Edsel was a convicted arsonist. As a boy, he had burnt down his family’s house and killed their dog. But he was reformed, Nash said. Edsel had done his time in a juvenile lockup, completed a reentry program and returned to society as a productive member of the workforce. But as Nash’s testimony progressed, it began to unravel under acute questioning from Edsel’s defense attorney. Although he dutifully recited his seemingly scripted lines, Nash’s delivery told a completely different tale. He lurched forward in his seat, gnawed at his fingernails, rubbed his face profusely and turned beet red while fumbling over his words. Alone, that probably wouldn’t have been enough to convict or even charge Nash with setting fire to his own factory, but it surely was enough to absolve Edsel of the crime and to win the Philadelphia mock trial championship for Roman Catholic High School earlier this month. “We’re kind of known for coming up with these outrageous cases for the defense,” said Roman co-captain Christian Dellavella, who alternates between prosecutor and defense attorney roles in the courtroom drama that is mock trial. Presented annually by Temple Law’s Legal Education and Participation Program in partnership with the Philadelphia Bar Association’s Young Lawyers Division, the John C. Bradway High School Mock Trial Competition involves about 50 teams from throughout the city and its suburbs. Working attorneys judge each of the individual performances on a list of criteria in calculating team scores. Roman, on the strength of its unorthodox presentation of the prescribed criminal case, emerged as the victor for the fourth conutive year and the fifth time since 2010. Last weekend, the Cahillites carried their city title to Harrisburg where they placed second in the state tournament for the third time in the last four years. Feeding on its own success and the knowledgeable guidance of alumni, Roman’s mock trial program has grown over the last decade from about 10 participants to this year’s crop of 47. That’s enough to field four varsity teams and a JV. They hail from diverse corners of the city. On the title-winning “A” squad, co-captain Joe Doherty of Fox Chase portrays Nash, the duped auto industry magnate, while Josh Picciotti from 17th and Ritner streets is the defense attorney under whose direct examination Nash crumbles. Bensalem’s Joe Pizzo portrays Edsel, the defendant who may or may not be falsely accused — he’s innocent when Roman stages the defense. Mount Airy’s Paul Keene is an expert witness with a British accent who testifies to the likelihood that Edsel has become a recidivist. Packer Park resident Justin Vespasiani plays the father of the defendant who witnesses his son fleeing the fire scene. Ryan Frank of Mayfair is a prosecuting attorney, while Nick Hamilton of Pine Valley is a defense attorney. Steven Patton, a real-life assistant district attorney in Philadelphia and 2008 Roman graduate, is the head coach while John Pensabene is the varsity coach and faculty moderator. The program has nine coaches in all. As a group, their commitment rivals any sports team or extracurricular activity at Roman. Their preparations for the season began near the end of last school year. They meet for about four hours each Saturday in addition to after-school sessions as needed, usually when competitions are imminent. “Seven of us haven’t had a week off from mock trial since June,” Vespasiani said. That’s when they first got their hands on the case materials for a series of competitions presented by the Empire Mock Trial program. In October, they traveled to Empire’s “World Championship” in San Francisco and placed second. They’ve also competed in three college-sponsored tournaments at La Salle, Penn and the University of Pittsburgh. Roman’s “A” team won two of the college events, while one of its other varsity teams won the third. “We have the largest mock trial program in the state,” Pensabene said. At the city tournament, all four of Roman’s varsity teams advanced to the final 16. Three made the quarterfinals and two made the semis. The eventual victors knocked out another Roman squad in the final four. Team members reap a multitude of benefits from their participation. In general, it’s a great way to develop their public speaking and acting skills. It also looks good on a resume, Keene said. The travel appealed to Vespasiani, while Picciotti wanted to meet new people. Winning was the big draw for Pizzo. “I think it’s just the idea of getting a (championship) ring,” he said. The program isn’t for the faint of heart. There’s little room for stagnation on a roster packed with go-getters.